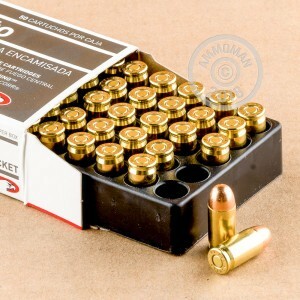 An important part of a concealed carry plan involves deliberate practice which requires clean, dependable training ammo that won't burn through your savings. 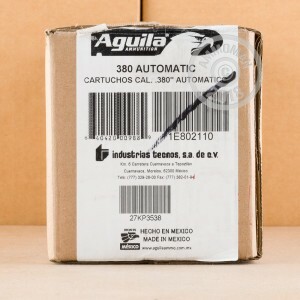 Aguila's ammunition is manufactured in Mexico on top-notch machinery and is backed by about five decades of expertise. 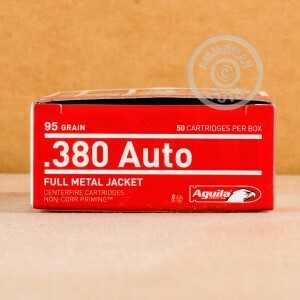 An extensive quality assurance process means that these .380 Auto rounds will cycle and ignite without issue. Components include reusable brass cases, Boxer primers that are free of caustic substances, and full metal jacket (FMJ) projectiles. At 95 grains, these rounds match the recoil and travel characteristics of the most common loads in the caliber and will function great in the classic Walther PPK or Beretta 82 as well as the modern Glock 42 and Ruger LCP II. Some proponents of these pocket pistols prefer to use a ball round such as this for self-defense due to its greater penetration when combined with short barrels.